Before a kitten comes to your home, you need to get prepared for it. What should you purchase before the arrival of your Abyssinian kitten? First of all, a kitten will need bowls for food and drinking water. It’s better to buy bowls of three different kinds – a shallow bowl for wet food, a deep bowl for dry food and a deep stable bowl for drinking water. Pay attention that it’s better to buy glass, ceramic or metal bowls, but certainly not plastic ones, as plastic bowls are an excellent breeding ground for various microbes and bacteria. We prefer ceramic bowls as they are most hygienic, easy and convenient to use. Open cat litter trays are the most commonly used ones, but it’s better to choose a hooded cat litter box as it prevents the litter from scattering, traps odors and provides privacy for your cat. This variant is most suitable and convenient for a kitten. Any kind of litter may be used in such litter boxes; and the removable hood means easy access for cleaning and maintenance. A couple of words about open litter trays with a plastic grid. It may be comfortable if you constantly stay at home and have a possibility to clean and wash it up to six times a day. Unfortunately, it may complicate your life with unpleasant odors and scattered litter, but many cat owners find this variant good enough for their homes. Over the past few years, organic, biodegradable cat litters have become increasingly popular, as they have certain advantages over other types of litters. For one, they’re more eco-friendly, as they’re made from all-natural cat litter substances, which can include materials like wheat, corn, grass, walnut shells, pine or even recycled newspapers. Because of this, they are flushable and can even be composted. Another plus is that biodegradable cat litter typically consists of larger-grained pellets, which in turn makes for acceptable kitten litter, since kittens can’t ingest the particles. Many biodegradable cat litters come in clumping varieties. The most popular types of cat litter are clumping clay litters, one reason being the price; they’re drastically less expensive than many of the other types available, such as natural, biodegradable cat litter. Most are effective at controlling odors – a key concern for owners when choosing a litter – and they make cleaning out the litter box much more painless. However, most consist of fine-grained clays, which can be dusty or even tracked throughout the house by a cat. Fine-grained cat litter isn’t appropriate for kittens under 3 months old, as the small particles can get into their respiratory tract. Clay-based cat litter isn’t biodegradable and should never ever be flushed down the toilet for disposal. Cat owners praise crystal cat litters a lot, but experts typically dislike them because they consist of jagged, crystalline particles that can be rough on cats’ feet. On the other hand, many pet owners swear by crystal cat litters because they’re extremely absorbent – thanks to the sodium silicate or silica gel used – and don’t need to be changed as frequently as other types of cat litter. One important notice: when the crystals reach their absorbency limit, you can expect a pool of urine in the bottom of the cat litter box. A cat scratcher or a scratching post is a wooden post or even a complex consisting of several posts, houses, cozy cave-like areas, shelves and horizontal platforms for climbing, which are covered in rough fabric or sisal that cat owners provide so their pets have an acceptable place to scratch. Cats have a natural urge to scratch: the action helps them remove old material from their claws, and they mark territory with scent glands in their paws. Indoor cats may be prevented from exercising this urge on furniture if they are provided with an acceptable scratching post. The scratching post is mounted vertically in a wide base, which allows the cat to stretch upward on its rear legs and scratch freely without tipping it over. A post that is unstable or does not allow a cat to fully extend its body might put off the cat from using it. Surfaces may vary: the post may be covered in sisal rope, upholstery fabric or the jute backing of a piece of carpet. In many cases cat owners need to train their pets to claw approved surfaces. A kitten’s paws are like the hands of babies. As they grow, they will become more and more important tools for life, and claws are an essential part of cats’ paws. And like babies, they may use those tools in destructive ways unless they are trained. Please learn to respect your cat’s claws. Never even consider declawing as an option, nor getting rid of the cat. Instead, consider the training options you need to use, even as you’d train an errant toddler. Play with your cat near the post and put a little catnip on the post to make it more appealing. Pretend you’re a cat and scratch the post yourself; before you know it, the kitty might join you. Praise your cat profusely and give him one of his favorite treats when he uses his scratching post. If a kitten tends to use a carpet, a piece of your furniture or any other item as a scratcher, take it gently to the scratching post trying to distract the kitten from undesirable objects. A little bit of patience and your kitten will start scratching its nails in a proper place. So, a cat scratcher is a very essential accessory for your home if you want to protect your furniture from your pet. A cat nail clipper (trimmer) is a pair of special scissors for clipping the pointed appendage of the cat’s nails. Nail clippers fall into several of the following styles: scissors, guillotine-type, pliers and electric. It is highly recommended to trim your cat’s nails about every 2-3 weeks. Keeping them properly trimmed is very vital to your cat’s overall health and well-being, especially if they are full-time indoor cats. Trimmed cat claws also protect you, your family (perhaps children), guests, and your household furniture! The number one rule is to never cut to the quick – the slightly pink-colored part of their nail where all the nerves and blood vessels are. The white/clear part of the nail is the only thing that should be cut; it’s always better to trim off smaller portions than larger in order to avoid the wounds and bleeding. Ideally you should introduce your cat to nail clipping when he’s a kitten. It is easier to start kittens on the right path than to retrain an adult cat, but even older cats can learn to enjoy having their feet handled and to accept nail trimming. But go slow! Paws are one of the most sensitive parts of a cat’s body. They will often pull away from you and make the job more difficult. If your cat is sensitive, try warming them up to the concept during petting sessions. When the cat is most relaxed, touch one of its paws. Then, gently push on their pads, extending a claw, gently praising the whole time. Make sure your trimmers are sharp. Dull trimmers will crush and splinter the nail. A must-have accessory which many neglect is a carrier or a bag/box for transportation of the pet. 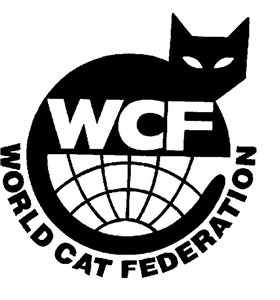 You will need it when you come to take the kitten from the cattery to your home or when you go to the veterinary clinic to revaccinate your cat (which is required to be done annually) or for any other reasons. As much as you might like to bring your cat with you everywhere you go, travel makes many cats nervous. For some cats, simply leaving the house is cause for terror. As much as your cat may hate it, however, it becomes necessary to take your cat out of the house once in a while whether for travel or just a trip to the vet. To keep your cat safe and secure, you need to invest in a high-quality cat carrier. Cat carriers come in all shapes and sizes with different designs depending on the intended use. Soft-sided carriers are typically lightweight and easy to store, while hard-sided carriers offer sturdier protection. You shouldn’t buy a lot of toys at once. At first a couple of teasers with feathers and some small mice and balls will be enough. Also kittens are usually very interested in various tunnels, laser toys as well as any rotating and dangling toys. Later you will get to know what exactly your pet prefers and most likely you’ll be buying only one or two kinds of cat toys. The necessity of having this accessory in your home is rather controversial. On one hand, cats are self-contained and mysterious. Your cat may totally refuse to sleep in a cat house or bed bought for him with love, but he will choose a window sill, a sofa back or a half-empty shelf in a bookcase for sleeping. He can even sleep on the floor behind the sofa. Therefore, take your time with the purchase of this accessory before you learn your pet’s preferences. However, a bed or a mat will be useful to you at a cat show to put it in a tent or cage where the cat will be happy to sleep and hide its nose from the visitors of the show. Before buying any cat food (wet or dry) you must ask the cat breeder about the food and eating habits of your pet. Or discuss with the breeder a possibility to transition your kitten to a new food. It’s not at all easy to buy a kitten, as it may seem. It’s not enough to choose a breeder or a cattery, to select a kitten by photo and to prepare a needed sum of money. It’s pretty important to take into account some other issues as well. First of all, get in touch with the cat breeder. Use the contact information about the breeder or the cattery, which is indicated on the website, in an advert or in social media. What should you ask if you want to buy a pedigree kitten? - are there any kittens (or a specific kitten) available for sale at the moment? have they already been reserved? - do they sell the kitten for the price indicated in the advert or is the price different? - is the kitten you are interested in being sold for breeding or as a pet (sterilized)? - which documents will be provided at the time of purchase? will the contract be concluded and are there any specific terms and conditions in the contract? - in which club / association / system is the breeder (cattery) listed as a member? - at what age can you take the kitten and is it possible to reserve it in advance? what is the price and conditions for reservation? - if the kitten comes from another city / country, what are the terms and the price for its delivery? - is the kitten accustomed to the cat scratcher and the cat toilet? If you are satisfied with everything, fix the time for a meeting. But you’d better first think for a while and call back later. You may also contact the indicated cat club and get to know if the cat breeder in question is actually listed as its member. - pedigree kittens must have documents (kitten’s card / certificate of registration or its equivalent and international veterinary certificate). If you buy a kitten from another city / country and you have no opportunity to visit the cat breeder, you should watch the selected kitten via Skype, for example (modern technologies make it possible to see a cat practically from any part of the world). Do not buy a kitten by photo! Photos in adverts on the internet may be taken from any source and later on you will never be able to prove that you received a totally different kitten from the one you selected. By the same reason you shouldn’t agree for the kitten to be delivered by any third person (by a courier or an air hostess, for example). The best way is to come and take the kitten yourself or ask the breeder to hand it to you personally, or at least beg your reliable friends / acquaintances for help. What should the kitten look like when you come to take it? Remember that nobody forces you to buy the kitten you have seen in the advert. Take the one that you like most, if it’s not already reserved, of course. You may purchase a kitten at once or reserve it. As you cannot take the kitten until it is 3-4 months old, you should reserve it, that is to pay approximately half of its price (or less as agreed with the breeder). As a rule, if in future you refuse to buy the kitten, this money will not be returned. So, think at least twice before you make such a reservation. Together with the kitten you must receive all necessary documents: an international veterinary certificate with the data on all the vaccinations done to the kitten and on anthelminthic treatment, and one copy of the contract signed by you and the breeder. The kitten must also have a kitten card / certificate of registration or its equivalent confirming its origin. And now, finally, you are a rightful owner of a purring cub of happiness. GENERAL: the overall impression of the ideal Abyssinian would be a colorful cat with a distinctly ticked coat, medium in size and regal in appearance. 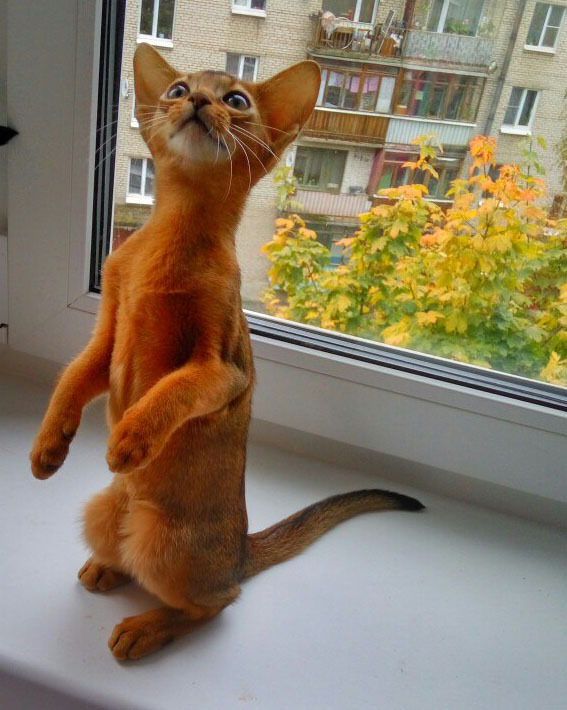 The Abyssinian is lithe, hard and muscular, showing eager activity and a lively interest in all surroundings. Well balanced temperamentally and physically with all elements of the cat in pro¬portion. HEAD: a modified, slightly rounded wedge without flat planes; the brow, cheek, and profile lines all showing a gentle contour. A slight rise from the bridge of the nose to the forehead, which should be of good size, with width between the ears and flowing into the arched neck without a break. MUZZLE: not sharply pointed or square. The chin should be neither receding nor protruding. Allowance should be made for jowls in adult males. EARS: alert, large, and moderately pointed; broad, and cupped at base and set as though listening. Hair on ears very short and close | lying, preferably tipped with black on a ruddy Abyssinian, chocolate- brown on a red Abyssinian, slate blue on the blue Abyssinian, or light cocoa brown on a fawn Abyssinian. EYES: almond shaped, large, brilliant, and expressive. Neither round nor oriental. Eyes accentuated by fine dark line, encircled by light colored area. BODY: medium long, lithe and graceful, but showing well developed muscular strength without coarseness. Abyssinian conformation strikes a medium between the extremes of the cobby and the svelte lengthy type. Proportion and general balance more to be desired than mere size. LEGS and FEET: proportionately slim, fine boned. The Abyssinian stands well off the ground giving the impression of being on tip toe. Paws small, oval, and compact. Toes: five in front and four behind. COAT: soft, silky, fine in texture, but dense and resilient to the touch with a lustrous sheen. Medium in length but long enough to accom¬modate two or three dark bands of ticking. Coat color: warm and glowing. Ticking: distinct and even, with dark (tail tip color) colored bands contrasting with undercoat colored bands on the hair shafts. Undercoat color clear and bright to the skin. Deeper color shades desired, however intensity of ticking not to be sacrificed for depth of color. Darker shading along spine allowed if fully ticked. Preference given to cats UNMARKED on the undersides, chest, and legs; tail without rings. Facial Markings: dark lines extending from eyes and brows, cheekbone shading, dots and shad¬ing on whisker pads are all desirable enhancements. Eyes accentu¬ated by fine dark line, encircled by light colored area. Eye color: gold or green, the more richness and depth of color the better. RUDDY: coat ruddy brown (burnt-sienna), ticked with black; the extreme outer tip to be the darkest, with orange-brown undercoat. Tail tipped with black. The underside and inside of legs to be a tint to harmonize with the main color. Nose leather: tile red. Paw pads: black or brown, with black between toes, extending slightly beyond the paws. RED (cinnamon gene): coat rich, warm glowing red, ticked with chocolate-brown, the extreme outer tip to be darkest, with red - orange undercoat. Tail tipped with chocolate-brown. The underside and inside of legs to be a tint to harmonize with the main color. Nose leather: rosy pink. Paw pads: pink, with chocolate-brown between toes, extending slightly beyond the paws. BLUE: coat warm beige, ticked with slate blue, the extreme outer tip to be the darkest, with blush beige undercoat. T ail tipped with slate blue. The underside and inside of legs to be a tint to harmonize with the main color. Nose leather: old rose. Paw pads: mauve, with slate blue between toes, extending slightly beyond the paws. FAWN: coat warm rose-beige, ticked with light cocoa brown, the extreme outer tip to be the darkest, with blush beige undercoat. Tail tipped with light cocoa brown. The underside and inside of legs to be a tint to harmonize with the main color. Nose leather: salmon. Paw pads: pink with light cocoa brown between the toes, extending slightly beyond the paws. Abyssinian allowable outcross breeds: none. PENALIZE: off-color pads. Long narrow head, short round head. Barring on legs, dark broken necklace markings, rings on tail. Coldness or grey tones in the coat. White undercoat on blue or fawn Abyssinians. DISQUALIFY: white locket, or white anywhere other than nostril, chin, and upper throat area. Kinked or abnormal tail. Dark unbroken necklace. Grey undercoat close to the skin extending throughout a major portion of the body. Any black hair on red Abyssinian. Incorrect number of toes. Any color other than the four accepted colors. The cat is medium sized and elegant. The body is of medium length, firm, lithe and muscular. The legs are sinewy, long and slender. The paws are narrow and oval. The long tail is strong at the base and ends in a tapering tip. The neck is slender. The head shows a moderate wedge shape and gently rounded contours. The nose is of medium length. The profile is slightly curved. The chin is firm. The ears are large and set wide apart. They are broad at the base and slightly rounded at the tips. Ear tufts and a thumb print are desired. The eyes are large, brilliant and expressive, slightly almond-shaped and set wide apart. The eye colour is pure and clear, amber to green. In the silver varieties green is preferred. The eye lids are encircled (eye rims) with the colour of the ticking in all colour varieties. Double or preferably triple banding on each single hair. The ticking shall be extended evenly and without stripes over the entire body. The line along the spine (eel line), the tail tip and the plantar side of the hind paws are coloured intensely in the colour of the ticking. The chest, belly and the inner side of the legs are without ticking and of the corresponding base colour. Coat colour: The base colour is dark apricot to dark orange. Ticking: black. Nose leather: brick-red black rimmed. Paw pads: black. Eye rims: black. Coat colour: The base colour is gently beige to light cream. Ticking: steel-blue. Nose leather: brick-red blue rimmed. Paw pads: blue-grey. Eye rims: blue-grey. Remark: In case of a light base colour the contrast is strong to the colour of the ticking, which should not be massed up with silver ticked. Coat colour: The base colour is dark apricot. Ticking: intense rusty brown. Nose leather: dark pink red-brown rimmed. Paw pads: dark pink. Eye rims: red-brown. Coat colour: The base colour is a dull, weak cream. Ticking: dark, warm cream. Nose leather: pink old-rose rimmed. Paw pads: old-rose. Eye rims: old-rose. Coat colour: The base colour is an intense apricot. Ticking: chocolate. Nose leather: old-rose chocolate rimmed. Paw pads: chocolate. Eye rims: chocolate. Coat colour: The base colour is pure silver-white. Ticking: black. Nose leather: brick-red black rimmed. Paw pads: black or seal. Eye rims: black. Coat colour: The base colour is pure silver-white. Ticking: steel-blue. Nose leather: brick-red blue rimmed. Paw pads: blue-grey. Eye rims: blue-grey. Coat colour: The base colour is pure silver-white. Ticking: red-brown. Nose leather: brick-red brown rimmed. Paw pads: cinnamon to chocolate. Eye rims: chocolate. Coat colour: The base colour is pure silver-white. Ticking: warm cream. Nose leather: pink old-rose rimmed. Paw pads: old-rose. Eye rims: old-rose. Coat colour: The base colour is pure silver-white. Ticking: chocolate. Nose leather: old-rose chocolate rimmed. Paw pads: chocolate. Eye rims: chocolate. The Abyssinian cat, also known as Aby, is one of the most popular cat breeds being domesticated by many of people in Europe and the USA nowadays. It has always been described as a cat with a distinctive ticked coat. The word “Abyssinian” pertains to Ethiopia. However, there are numerous stories, legends and rumors about the origin of this cat breed. The Abyssinian is one of the oldest breeds of domesticated cats, but its real ancestry is lost in time. Romantic tales call it the cat from the Blue Nile saying it is a direct descendant of the sacred cat of Ancient Egypt because it resembles the cats depicted in Egyptian murals and artifacts. Others believe that the first Abyssinian cat named Zula was brought to England from Abyssinia (modern Ethiopia) by a British soldier at the end of the Abyssinian war in 1868. Zula actually was the first documented Abyssinian cat. In December 1871 at the Crystal Palace cat show it won the third prize among 160 other cats of different breeds. So far, no documentation links Zula to the cats of today. Some genetic researches have suggested that this shorthair cat originated near the coast of the Indian Ocean where colonists may have purchased animals from the wild animal traders. In addition to that, some studies have indicated that the coast of the Indian Ocean between Singapore and Ceylon is said to be the homeland of the Abyssinian Tabby color pattern. There are also stories that have been told that the wild Abyssinians live in parts of North Africa today. The Abyssinian shape and distinctive coat also bears a striking resemblance to the African Wild cats. The first registration of the breed appeared in English studbooks in 1896. The earliest distinguishable Aby can be found in the Leiden Museum in Holland. It has a label that reads “domestica India” which indicates the origin to the same area. The Abyssinian was developed and refined in Britain. The first Abyssinian arrived in the United States in the early 1900s and they were first exhibited in 1909. But Abyssinian breeding programs didn’t get a real start in the United States until the 1930s, when more of the cats were imported from Britain. It was really happy fortune as only a dozen of the cats had survived in England by the end of the war. The breed bounced back, however, and has become one of the most popular and favorite cat breeds in the world because of its expressive eyes, unique coat pattern and personality. The Somali is the stunning long-haired descendant of the Abyssinian and is named for Somalia which borders Ethiopia, formerly Abyssinia, to represent their connection to each other. 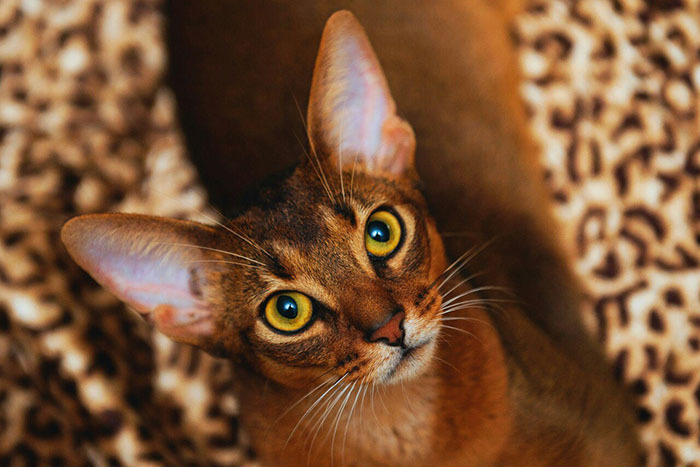 Abyssinians look like a small mountain lion or cougar with almond eyes set in a dramatically marked expressive face and a spectacularly warmly ticked coat that produces a shimmering iridescence whether still or in motion. They are athletic, alert and very active. Even though they are well-muscled their movement is lithe, graceful and very quick. Their carriage is confident and regal. The body of the Abyssinian cat is of medium length, flexible and has well-developed muscles. Their legs are slim in proportion to the body with a good bone structure. They have small and oval paws and have a fairly long tail, broad at the base and tapering to a point. The head of the Abyssinian is broad and moderately wedge-shaped. Their eyes have an almond shape that range from green, gold, copper or hazel. Usually, the nose and chin form a straight vertical line when viewed in profile. The ears are relatively large, broad and cupped at the base and moderately pointed at the tips, where tufts of hair are normally seen. There’s an M-shaped marking that is found in the fur on the forehead. The M-shaped marking, also referred to as “frown lines”, are located above the Abyssinian’s eyes. They also have markings which are often referred to as mascara lines and usually appear from the corners of their eyes. With regards to their fur, the Abyssinian’s coat is medium in length, dense and thick to touch. The coat is resilient and when rubbed against the lay of the coat it snaps back into place. This kind of cat has coats that are unusual enough to capture attention. Their fur has a very fine texture rather than being of a soft quality which bears several dark bands over a lighter shade marking the coat evenly giving it a ticked coat pattern. The iridescent warmth of the coat color is produced by the Agouti ticking. Each hair has a light base with three or four bands of additional color growing darker towards the tip. The base colour should be as clear as possible; any extensive intermingling with grey is considered a serious fault. A tendency to white on the chin is common but likewise must be minimal. The ticked or agouti effect that is the trademark of the breed – genetically a variant of the tabby pattern – should be uniform over the body, although the ridge of the spine and tail, back of the hind legs and the pads of the paws are always noticeably darker. 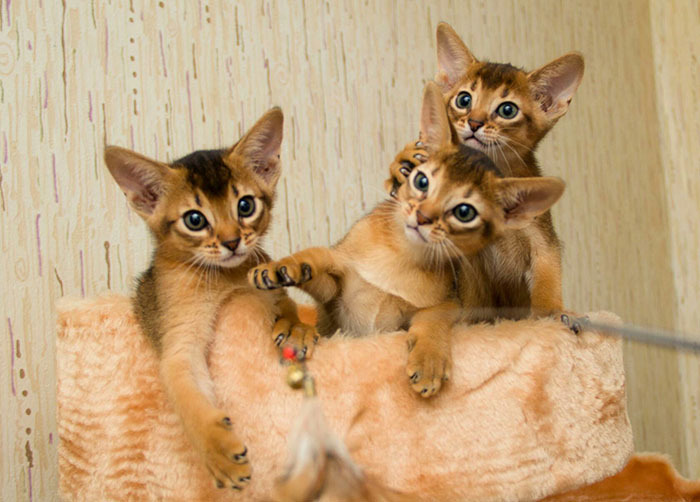 Abyssinian kittens are born with dark coats that gradually lighten as they mature, usually over several months. The adult coat should not be excessively short and is ideally fine, dense and close-lying, silky to the touch. Abys are bred in the following colors: ruddy (known as "usual" in the United Kingdom), chocolate, sorrel (also called cinnamon or red), blue, lilac and fawn and the silver version of these colors where an icy white coloration closest to the skin is followed by ticking up the hair shaft. Ruddy color is characterized by a warm deep reddish-brown base with black ticking. Sorrel has a lighter coppery base with chocolate brown ticking. Other variants have been introduced by outcrossings to the Burmese and other shorthaired breeds, notably blue (on a warm beige base) and fawn (on a softer cream base). 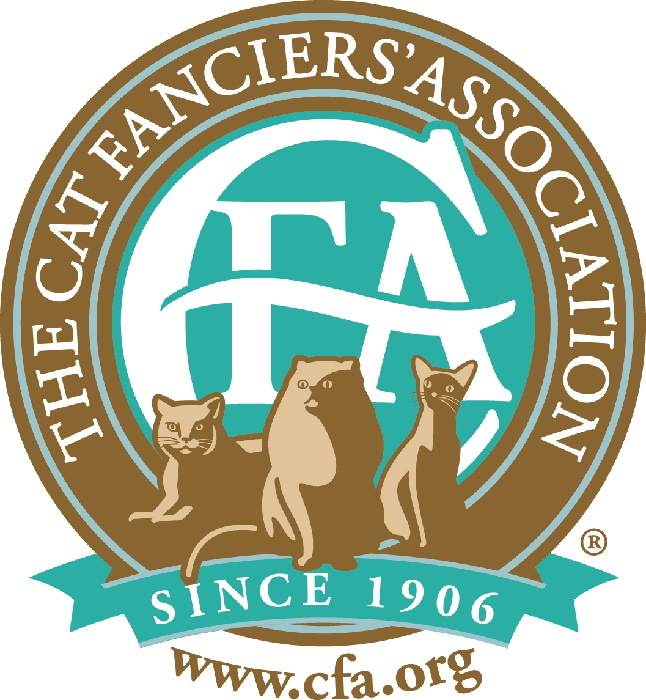 The less common chocolate and lilac are not recognized in the Cat Fancier's Association (CFA) breed standard but have been granted full champion status in The International Cat Association (TICA) and in the UK. The UK also recognizes the silver Abyssinian, in which the base coat is a pure silvery white with black (called "usual silver"), blue, cream or sorrel ticking. Various other colour combinations are in development, including the "torbie", in which a patched tortoiseshell pattern in any of these colors is visible under the tabby banding. Abyssinians are one of the most intelligent breeds of cats. Of all the cat breeds, the Abyssinian is perhaps the one who lives life to the fullest. They are very active, affectionate and playful extroverts. They are extremely motivated and curious. They are good in solving practical problems and tend to retain a kittenish playful behavior into adulthood. No place ever goes unexplored and yet seldom do they knock anything off of a shelf or countertop. A love of heights is a signal trait of the Abyssinian. It likes to be as high up as possible and will appreciate having one or more ceiling-height cat trees. Sometimes it may seem as if the Aby never sleeps. It is ever in motion, jumping up in the window to look at birds or squirrels, leaping on top of the refrigerator to supervise meal preparation, perching on your desk to watch your fingers move over the keyboard and then swiping at them so you’ll pay attention to it instead. This is a playful, persistent cat that adores being the center of attention and will do anything to achieve and maintain that status. Abyssinians are loyal and very interactive with their owners and environment. They are wonderful companions who are highly interested in everything around them and what everybody is doing. Not usually considered a lap cat due to their high energy and curiosity levels, Abys do occasionally make visits to your lap or find a way under the covers to spend time near their beloved owners. The way they transform within seconds from a radiant and regal presence into an amazingly playful character with childlike antics and an indomitable spirit is astounding. This cat breed is one that is more inclined to accept dogs and older children since they are very well oriented with people and animals. They tend to have an average lifespan of around 9-15+ years. However, if proper care and nutrition is given with the advancement of veterinary medicine, this breed of cat can live up to 20 years and even longer. They can have an average weight of around 6 to 10 pounds. • Patellar luxation, a hereditary dislocation of the kneecap that can range from mild to severe. Severe cases can be alleviated with surgery. • Progressive retinal atrophy (PRA), a degenerative eye disease. • Pyruvate kinase deficiency (PKDef), for which a genetic test is available to identify carriers. • Renal amyloidosis, a heritable disease that occurs when a type of protein called amyloid is deposited in body organs, primarily the kidneys in Abyssinians. It eventually leads to kidney failure.